A diversion is in place at Lomaloma on Transinsular Road in Vanua Levu as cracks have started to re-appear on the Lomaloma stretch. 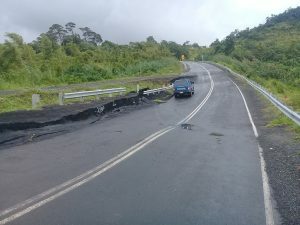 Fiji Roads Authority(FRA) Chief Executive Officer John Hutchinson confirms that the FRA North Team have been monitoring the site at Lomaloma and recent movement visible on the road surface has prompted the team to recommend an immediate closure with traffic diverted onto the side carriageway. Mr Hutchinson says that the Lomaloma slip reinstatement work was carried out in 2014 and 2015 and that it was unfortunate that the road surface has dropped and deformed to a large extent in the last few weeks. He adds a contributing factor is the heavy rainfall experienced in the area in the past weeks.